Parenting is not a structured, manual-style journey with specific instructions. One of the major concern that many parents fret over surrounds their children’s sleep. More specifically, when is the right time for children to sleep in their own beds, and the benefits of doing so. Other than giving parents a breather to have their intimate cozy time at night, allowing children to sleep alone also has a myriad of benefits to their sleep quality and childhood development. Growing children need more sleep than adults, being approximately 12 to 14 hours each day. Allowing your children to sleep on their own beds not only gives them the liberty to sleep in any comfortable position they want but also reduces external movements and disturbances that might otherwise disrupt their sleep. Children have a creative imagination and some might even fall prey to their own mind, picturing monsters under their bed, or they might just simply be afraid of the dark. Allowing them to sleep in their own bed by slowly coaxing them and staying by their side while they doze off is a great way to help them overcome their fear. When children learn to overcome their fears, their confidence is enhanced and this promotes a positive and healthy emotional development. Allowing your children to sleep alone give them a sense of accomplishment and this extends to the act of taking care of themselves in other aspects – such as keeping a good hygiene, packing up their toys and regulating their own sleep. Night time independence offers children the opportunities to reassure and calm themselves down if old childhood fears re-emerge, or if they are stressed and anxious. This will also mold them to be an independent and resilient individual. 4. When should you encourage your children to sleep alone? Babies are often accompanied by an adult during sleep, either in the same room or in the same bed, so that it is easier to tend to them when they need feeding or comforting. 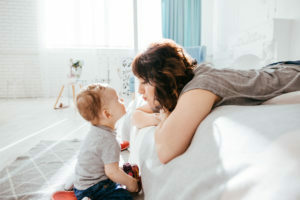 As they develop to toddlers from 12 to 36 months old, their attention skills, long and short-term memory and various other cognitive functions gradually enhance. Based on various research, there is no specific time between 12 to 36 months for a toddler to sleep alone. Instead, it depends on the innate personality of your child – a bright child with a cheerful and friendly disposition is more inclined to be able to sleep independently earlier, while a quieter and shy child may need to be coaxed into sleeping independently at an older age. Observe your child at night. If they show signs of being able to fall asleep at night without requiring your encouragement or reminder, that would be a good sign that they are ready to transit to independent sleeping. 5. How should you encourage toddlers to sleep in their own beds? 1) Start easy and stay next to them till they fall asleep, then leave their side. When they wake up alone in their own bed the next day, praise and recognize them for being able to fall asleep independently. Carry this out for a few days until you feel that your child is ready to fall asleep independently. 2) Next, move on to keep a distant lookout on your child as he or she dozes off, by sitting in a nearby armchair or standing at the door. Slowly ease yourself to leave the room before the child sleeps by using a bedtime signal – such as tucking them in or telling them a bedtime story as a cue to sleep. 3) Be sensitive to your child’s emotions. If you pick up any signs of bedtime discomfort, give them ample encouragement or stay by their side until they fall asleep for that particular night. This will prevent toddlers from getting the wrong idea that they are left to their own devices or feel abandoned. You can also reward your child the next morning with sweet treats to incentivize and motivate them to fall asleep independently. We hope these tips will provide a seamless transition to your toddler’s independently sleep.